Woking Football Club | News | £99 Season Tickets are back! £99 Season Tickets are back! 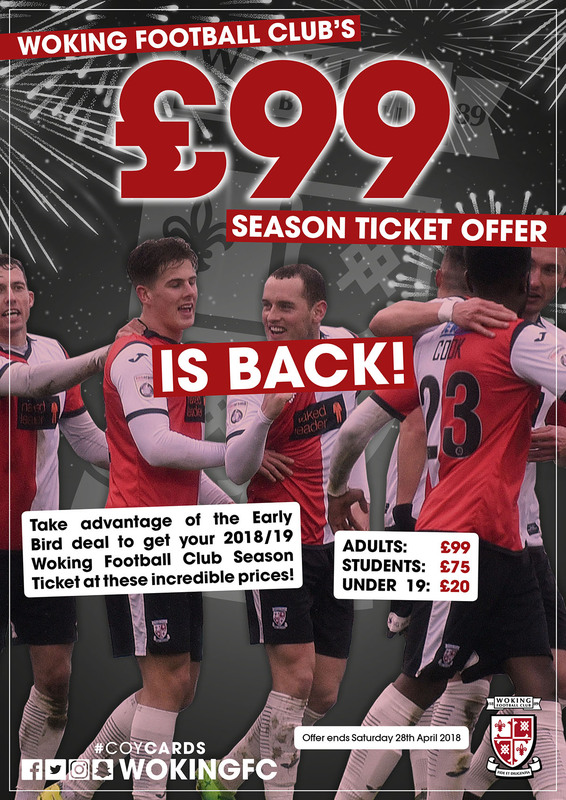 Woking Football Club's amazing £99 Season Ticket offer is back! The Early Bird deal was a fantastic success last time out so we're pleased to be able to offer it again. The price of a 2018/19 Season Ticket during the Early Bird period is only £99 for Adults, Concessions (over 65), and Disabled. For Students over 19 the price is £75, and for Under 19s it is just £20! To take advantage of this offer Season Ticket forms must be returned to the club by 3pm on Saturday 28th April 2018. Season Ticket renewal forms have been posted out to existing season ticket holders, along with Raffle Tickets for Woking Football Club's Summer Raffle. Please can fans try and sell tickets to their friends & family. To download a form please click here.